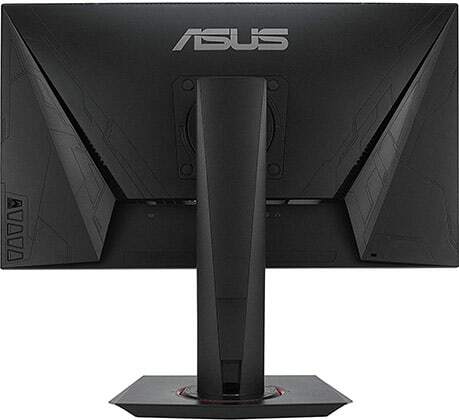 ASUS VG258QR Review 2019: Is This 165Hz Monitor Worth Your Money? 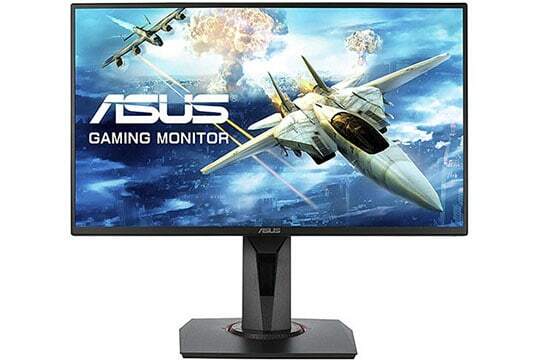 The ASUS VG258QR is a 25″ 1080p high refresh rate gaming monitor that boasts a 0.5ms response time speed. In comparison to the standard 25″ 1080p 144Hz 1ms models, the ASUS VG258QR also offers a slightly higher 165Hz refresh rate. Plus, it is G-SYNC compatible and has a backlight strobing technology. Continue reading to find out whether these premium features are worth the extra cost and what alternatives are there. As far as the picture quality is concerned, you’re getting the standard TN-like specifications including a 1,000:1 static contrast ratio, a 400-nit peak brightness, 8-bit color support via dithering (6-bit + FRC), and narrow 160°/170° viewing angles. Overall, the colors are a bit better while the image is slightly brighter in comparison to the previous-generation 24″ 1080p 144Hz TN models, but it’s still not as good as that of equally-priced IPS and VA models. 1080p resolution offers a decent pixel density (90 pixels per inch) on a 24.5″ screen of the ASUS VG258QR 165Hz gaming monitor. The details are not as clear as they are on 24″-27″ 1440p 144Hz TN models, but 1080p is also considerably less demanding to drive thus allowing you to reach higher frame rates more easily. We didn’t detect any dead/stuck pixels on our unit nor was there any other defects such as excessive backlight bleeding. The backlight of the monitor is flicker-free and there’s a low-blue light filter for those concerned about their ocular health. Turning to the performance of the ASUS VG258QR, we were disappointed; it’s not bad, but we expected more. First of all, the specified 0.5ms (GtG) response time speed is nothing but a marketing gimmick. To be fair, all monitor manufacturers put misleading response time values as they correspond to the shortest time a pixel can change from one shade of gray to another under certain testing conditions. It doesn’t indicate the average response time speed. Having said that, there is still no prominent trailing or motion blur in fast-paced games, but there’s no visible improvement over a standard 144Hz TN gaming monitor with a specified response time of 1ms (GtG). What’s more, the ASUS VG258QR monitor has a rather mediocre overdrive implementation. To adjust the overdrive, there’s the TraceFree feature which you can adjust from 0 to 100 in increments of 20. Having it at 40 or 60 eliminates most of ghosting, but 80 and 100 introduce noticeable pixel overshoot (inverse ghosting). So, just leave it at 60. The one thing where the ASUS VG258QR excels is the input lag performance with only ~3ms of delay. Moving on, AMD FreeSync is supported over both HDMI (40-144Hz) and DisplayPort (40-165Hz). 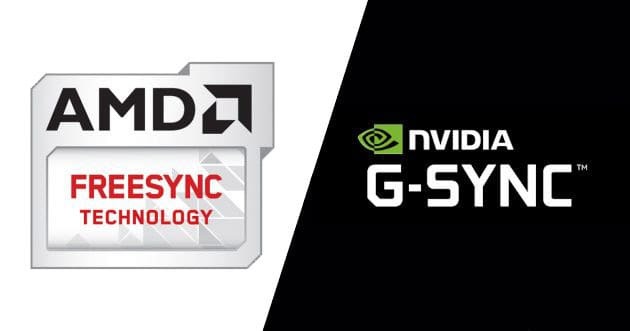 The ASUS VG258QR is also certified by NVIDIA with a ‘G-SYNC Compatible’ badge that ensures smooth FreeSync performance with compatible NVIDIA cards. Other features include ASUS GamePlus (custom crosshairs, an on-screen timer, and an FPS counter) and ASUS GameVisual (Racing, RTS, FPS, RPG, MOBA, sRGB, Cinema, and Scenery pre-calibrated picture presets). The ASUS VG258QR display also offers ASUS Extreme Low Motion Blur (AELM) which via backlight strobing provides a CRT-like motion clarity in fast-paced games. This technology only works at fixed refresh rates (120Hz, 144Hz, and 165Hz), so it cannot be active at the same time as FreeSync. 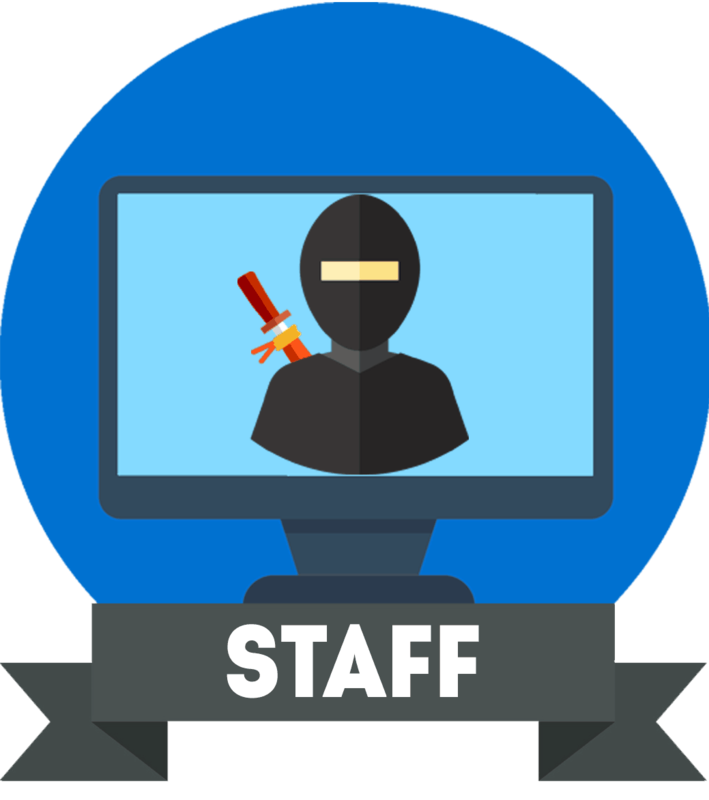 It also introduces flicker and reduces the monitor’s maximum brightness while it’s active, but the monitor is sufficiently bright regardless while the flicker won’t bother anyone but those very sensitive to it. Connectivity options include HDMI 1.4 (max 120Hz), Dual-Link DVI-D (max 144Hz), and DisplayPort 1.2 (max 165Hz). FreeSync works over both HDMI and DP while AELM only works over DP and DVI. There’s also a headphones jack and an audio line-in port for the dual 2W integrated speakers. The stand of the monitor is sturdy and versatile with up to 130mm of height adjustment, +/- 90° swivel, -5°/33° tilt, 90° pivot, and 100x100mm VESA mount compatibility. 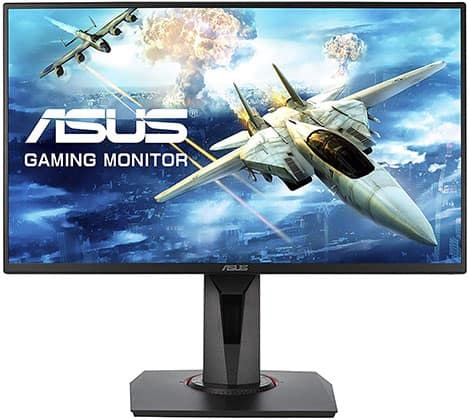 The ASUS VG258QR price amounts to around $300 which is a bit steep considering you can get a similar 25″ 1080p 144Hz 1ms gaming monitor for almost $100 less, such as the Acer KG251QF and the AOC G2590FX. These two gaming displays offer the same image quality and a pretty much identical performance as there’s no particularly noticeable difference between 165Hz and 144Hz (nor between 0.5ms and 1ms). However, they don’t have a backlight strobing technology. So, consider the VG258QR only if you intend on using its backlight strobing feature; otherwise, go with the Acer KG251QF or the AOC G2590FX. In case you want a cheaper 144Hz 1ms gaming monitor with motion blur reduction (MBR), check out the LG 24GL600F. Finally, if you can afford something a bit pricier, we suggest investing in a 240Hz model such as the Acer XF250Q or the ASUS XG248Q. “0.5ms response time” marking shenanigans aside, the ASUS VG258QR is an excellent gaming monitor with a great MBR technology that works all the way up to 165Hz whereas most 144Hz/165Hz models can strobe the backlight at 120Hz max. However, unless you’re purely upgrading for the backlight strobing technology, we suggest saving up for a good 240Hz model instead. If you’re coming from an older 24″ 1080p 144Hz 1ms display, the gaming experience on the ASUS VG258QR will be underwhelming. 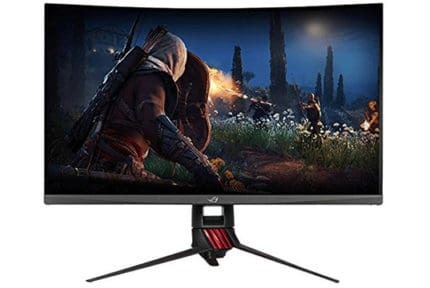 In case you’re looking for your first high refresh rate gaming monitor, we recommend a cheaper 24″-25″ 1080p 144Hz 1ms model as it will provide you with basically just as smooth performance as well as better value for the money. The ASUS VG258QR is a particularly great gaming monitor for those who are looking for a good backlight strobing implementation. Otherwise, there are better alternatives for the money.